Two-hole punched for storage in a post binder. Note: A minimum quantity of 120 must be ordered, and in units of 10 thereafter. 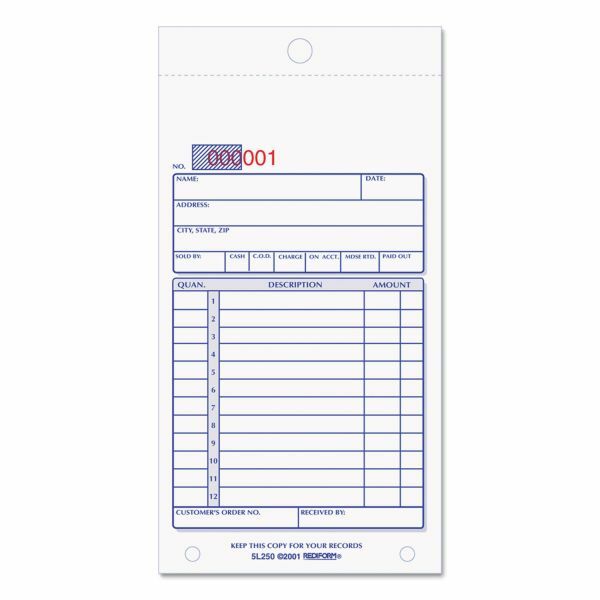 Rediform Sales Book, 3 5/8 x 6 3/8, Carbonless Triplicate, 50 Sets/Book - Carbonless, sales forms offer a simple format to record information with space for customer's information (name and address), date, seller, method of payment and up to 12 items with their quantity, description and cost. Two other boxes offer a place for the customer's order number and recipient of the merchandise. Special design transfers writing from the original to the two copies. 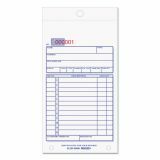 Three-part forms are consecutively numbered and come in a manifold book with a flexible cover. Paper sequence is originals in white, duplicates in yellow and triplicates in pink.